Slices of these cakes are little Italian carton boxes, where we put the confetti and a little card (bigliettino) printed with your information. These favors can be used for Bridal Showers, Baby Showers, Christenings, First Communions, Confirmations, Graduations, Anniversaries, and so on. Cakes can be made with any number of pieces, beginning with 11 up to a maximum of 50 boxes in two levels. 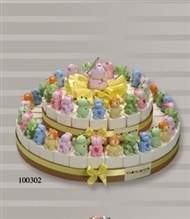 Larger cakes in other formats are also available, up to a maximum of 94 pieces. Looking for a specific decoration/color for your bomboniera cake? Contact us with your special request. Please allow 6-8 weeks for delivery. As prices vary with the number of pieces ordered, please contact us for specific pricing for your bomboniera cake. As a rough guide to pricing, cakes typically are priced at about $6.00 per piece.